Today I’m tasting a bargain Spanish blend, Cataregia Gran Resereva 2001, picked up at my favorite local wine shop, here in my corner of Brooklyn, BQE Wine & Liquors. I don’t mind letting one of my neighborhood secrets out because they neither ship out of town nor deliver locally, so anybody that wants to take advantage of their excellent selections and prices will have to walk in, just like everybody else in the 11222. So much has been said (rightly so) of the 2001 vintage in most of Spain (especially Rioja and Ribera del Deuro) that finding a Gran Reserva for under ten bucks makes me cautiously optimistic. I’m listening to the Mountain Goats’ (John Darnielle) “Autoclave” from their (his) Heretic Pride album. Mountain Goats is basically one guy, John Darnielle, who always plays as the Mountain Goats, regardless if he’s playing solo or with supporting players. While I know that so many of his long-time hardcores prefer his stripped down man-and-a-guitar stuff, and I can see the slick production rubbing some of these folks the wrong way, but the songwriting remains as remarkable as always. “Autocalve” has the awesome dichotomy of an upbeat, hooky tune and profoundly sad and deeply isolationist lyrics. 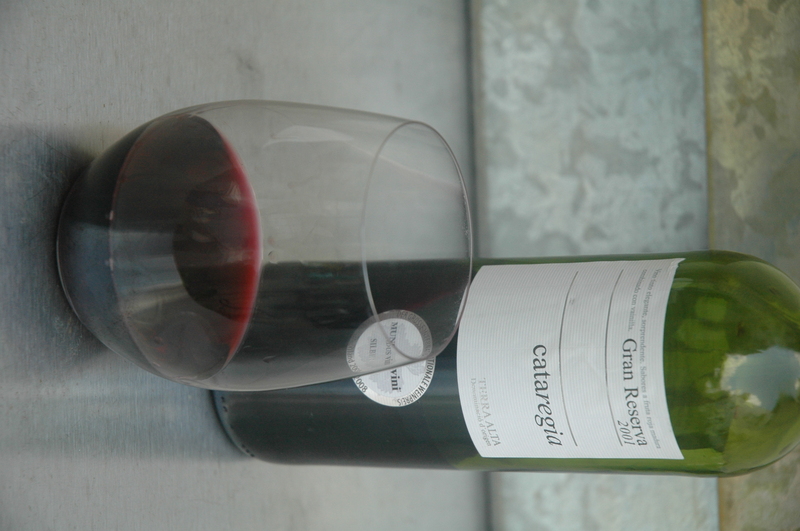 Cataregia Gran Resereva 2001 is 70% Tempranillo and 30% Cabernet Sauvignon and initially it tastes like mature Tempranillo and immature Cabernet in the same glass, somehow not blended; integration does occur, over time. The nose immediately hits with raspberry, which becomes sweet and ripe with some air in it. There are also notes of tobacco, tar, and a dusting of powdered black pepper. The alcoholic bite which initially lingers in the olfactory, integrates after an hour of oxygen contact, revealing a touch of vanillin and wildflowers in the negative space of the glass. This is really quite a nice wine for the fee. In fact, it’s almost impossible to find a 10 year old wine from a marquee vintage for ten bucks. I’m going to go buy a few more bottles before I post this.